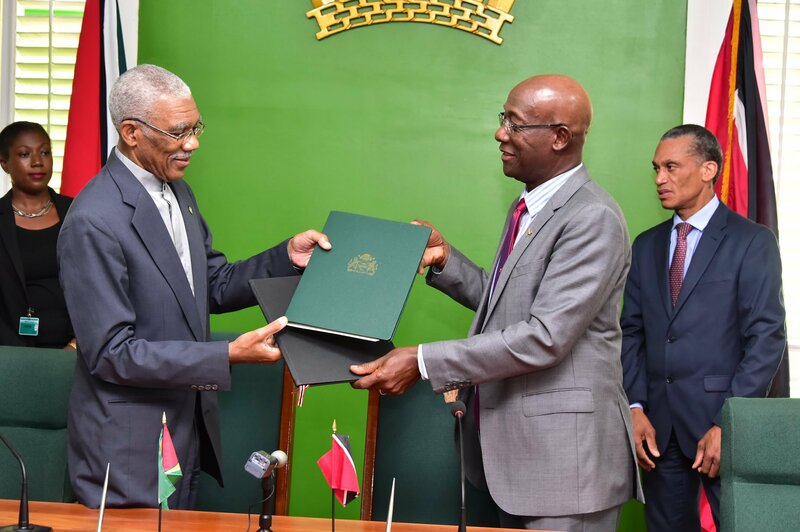 (Office of the Prime Minister of Trinidad and Tobago) Prime Minister Dr the Honourable Keith Rowley and President of the Cooperative Republic of Guyana His Excellency Brigadier David Granger signed a Memorandum of Understanding on Energy Sector Cooperation today Wednesday 19 September, 2018 (at State House, Georgetown, Guyana). Prime Minister Rowley said today represents a documentation of his country’s commitment to do more in its neighbourly relations with Guyana with respect to the generation of economic activity. He said both Governments were laying the ground work and providing the encouragement for the private sector to seize opportunities which are available to both countries at this time and that this was a good thing for the people of Trinidad and Tobago and Guyana. President Granger said he was confident that the combination of Guyana’s natural resources with the entrepreneurial expertise, capital and investment from Trinidad and Tobago would result in a win-win situation for both countries. He noted that there were unjustified fears that the signing of this agreement was tantamount to giving away the family jewels. “The MOU is a means of benefitting from Trinidad and Tobago’s advice, their experience and expertise that they have built up over a long time. So the fears that this is some give away are completely unjustified,” President Granger said. Prime Minister Rowley said he was disappointed by the sentiment expressed by some that this was a Trinidad and Tobago takeover of Guyana’s good fortune. He added, “We in Trinidad and Tobago are proud to have the record show that as a small developing country, which was not a member of the Paris Club, when Guyana sought debt forgiveness we in Trinidad and Tobago wrote off billions of dollars of Guyana’s debt.